International Beatleweek is returning this August in Liverpool. The annual festival see fans from over 40 countries Come Together for the fun. If you’ll be enjoying the best of Beatleweek this year in Liverpool, we’ve rounded up the most unmissable events and where to stay in style! Taking fans back to where it all began, International Beatleweek will kick off at the Cavern Club, Liverpool. The fun will begin on Wednesday 22nd August where festival goers can look forward to Rock ‘n’ roll all day long with live music across three stages covering the Cavern Club and Cavern Pub. On Thursday, the fun will continue at the Cavern Club. Bands and fans from across the globe will gather at the iconic Mathew Street venue for a day of live music. This year, George Harrison would have celebrated his 75th birthday. To mark the occasion, performers will be paying tribute to George throughout the afternoon, followed by a special finale. Fans can also enjoy live music all day outside on the patio stage. Alma de Cuba is an iconic bar and restaurant in Liverpool, situated only moments from Arthouse Hotel on dynamic Seel Street. Holland’s premier Beatles band The Analogues will take to the grand Philharmonic Hall stage and play The Beatles (White Album) in its entirety. The first of the week’s late night parties will showcase live music and bring fans the chance to celebrate until 5am! Beatleweek festivities usually incorporate a day out. And this year, attendees can look forward to stepping back in time at The Olympia (formerly known as the Locarno Ballroom). The Beatles played at the breathtaking venue on Valentine’s Day back in 1963. And this is a wonderful chance to relive the Beatlemania. Hosted at Liverpool’s grand Philharmonic Hall, this special show will feature Beatleweek artists and special guests, celebrating the 60 years of song-writing between Beatles legends Lennon & McCartney. Saturday’s party is the perfect way to spend your Saturday night with entertainment until late. Bringing fans together for a fantastic day, the Adelphi will play host to live music, films, guests speakers, Ringo Bingo and a flea market of unmissable memorabilia. Guests speakers include the one and only Pattie Boyd alongside Freda Kelly, Tony Bramwell and Joey Molland. The fun will continue at the Sunday Adelphi Party until 5am! The line up for Coachella in 2016 was a great one. The festival saw Sir Paul McCartney take to the stage alongside music icons Bob Dylan, The Rolling Stones, The Who, Neil Young and Roger Waters. Bringing Beatles fans their very own Scousechella, fans can look forward to six of the best tribute artists paying homage to the star-studded line up. Catch the “Fab Four Finale” with live music covering 4 stages at Beatles inspired Hard Days Night Hotel. With Beatleweek drawing to a close, don’t miss the Monday night party for the last late night celebration! The final day of Beatleweek will offer one last chance to get your Cavern Club fix with live music across two stages. 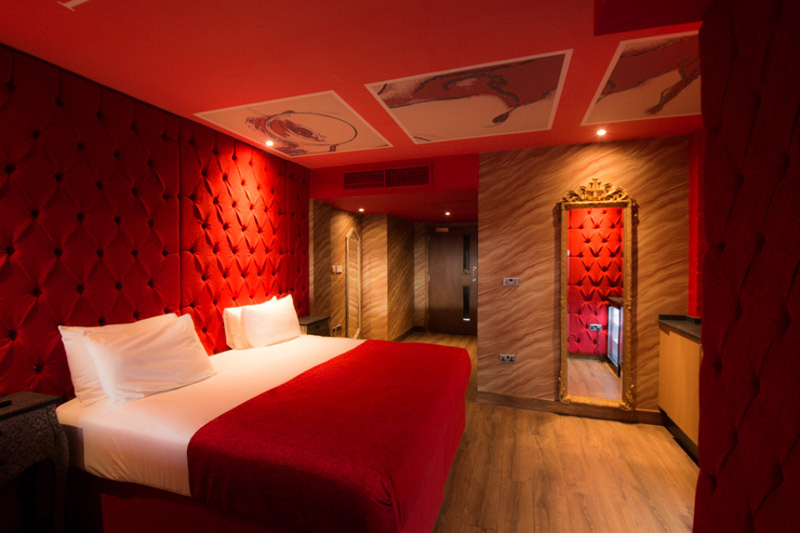 Arthouse Hotel offers the perfect place to stay for International Beatleweek in Liverpool. Specialising in spacious group accommodation, our themed rooms are fantastic for groups looking to stay in style. Our Yellow Submarine room sleeps up to 4 guests, ideal for those attending Beatleweek with family or friends. 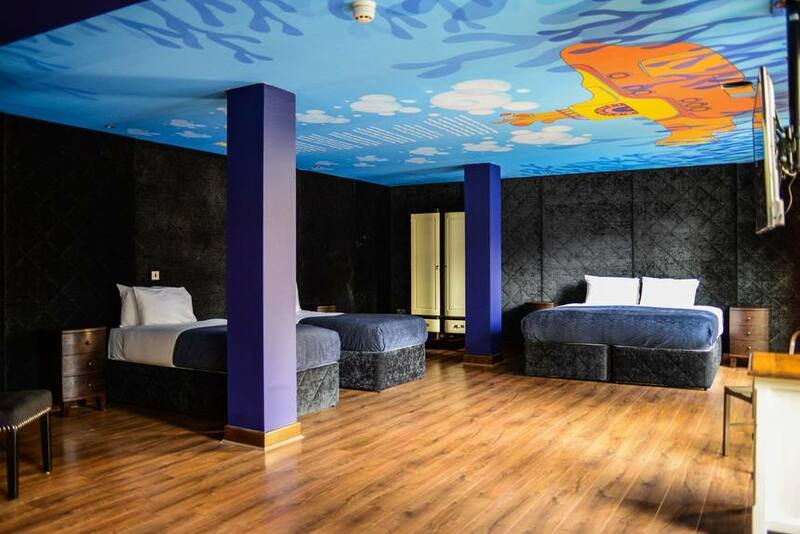 This spectacular themed room features Beatles lyrics above the beds, a colourful submarine print and fantastic amenities including a double whirlpool bath and TV. John Lennon fans can also make themselves right at home with a stay in our stunning John Lennon room. Inspired by Andy Warhol’s iconic Menlove Ave. album cover design, this spectacular space captures the creativity of Warhol and Lennon. If you’d like to book a stay with us for Beatleweek, make sure you don’t miss out on our unmissable hotel offers! Each package is designed to bring you the best of Arthouse Hotel, making your stay in Liverpool as special as can be. We look forward to seeing you soon and hope you have an unforgettable time celebrating the Fab Four! This entry was tagged Arthouse Hotel, Liverpool, Offers, Rooms. Bookmark the permalink.